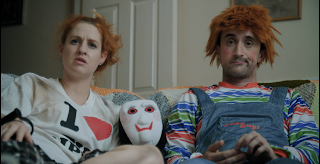 Hex Studios’ eight-part web series from writer-director Kate Shenton reunites her with EGOMANIAC stars Nic Lamont and Adam Rhys Davies in an appealing, funny horror-centric riff on TV’s “The Royle Family” and “Gogglebox”. Rhys Davies is a prolific killer of women who dresses up as a succession of famous horror movie killers to perform his handiwork. In cheap costume shop versions of Jason, Michael Myers, Leatherface, Chucky, Pinhead, Freddy and Hannibal Lecter, we watch him chatting about antiseptic cream, ID problems, Tinder, Nando’s, “Friends” and the nightmare of choosing something to watch on Netflix to the willing victim (Lamont) he holds captive in his flat. She is on a mission to be killed in the fashion of Jack the Ripper’s best known victim, Mary Jane Kelly, though considers postponement in the eighth, final episode so that she can be around to watch season three of “Stranger Things”. Plenty of talking-point TV shows are referenced in their delightful sofa-based interaction: everything from “The Crown” and “The Handmaids’ Tale” to “This Morning” and “American Horror Story”. There are echoes of BEHIND THE MASK: THE LESLIE VERNON STORY in Rhys Davies’ complaints of AMERICAN PSYCHO ruining it for real psychopaths and the annoyance of getting a stitch while chasing victims. Lamont has another absorbing character arc for Shenton as her character’s dream of an authentic Jack the Ripper re-enactment falls apart while she becomes jealous of the victims her captor has already claimed, doubting his ability to follow through. The eight bite-size episodes are breezy and funny, never outstaying their welcome and fostering significant affection for two characters who are arguably no more disturbed and no less insecure than the rest of us out there in couch potato land.